Please feel free to use the images as you please with credit to Brittany Partin. Over the course of my four years in Matsue, I put a lot of special effort into art, be it developing my hobbies or learning the ways of traditional Japanese aesthetics. Long-time readers of my blog will probably recall my adventures in competitive kimono dressing with regional contests in Kochi and Hiroshima and a shot at a world championship in Tokyo. However, since 2014, I limited my kimono practice to only occasional refreshers for getting myself dressed for tea ceremonies. Sure, I love the chance to dress up in traditional Japanese attire, be it for strolling around Izumo Taisha during my New Year shrine visit or taking part in Matsue’s early Edo inspired Warrior Parade. However, I chose to dedicate more time to tea ceremony practice. I still keep in touch with Kimono-sensei, of course. It just so happened that when I called her for advice on behalf of a friend who was getting started with her first kimono that she asked if I happened to be open on May 29th, during the annual kimono show she and her kimono buddies put on at the Matsue English Garden. As luck would have it, I did happened to be open that day, and thankfully there was no prep necessary for showing up on stage as a hanamusubi (folding obi in the shapes of flowers) model. Knowing this might be one of my last times to wear kimono for a while, Kimono-sensei specifically chose to have me model the tsubaki (camellia), because it is one of the representative flowers of Matsue. It just so happens that I’ve always had a very soft spot for tsubaki, so this made us all happy. After all, Kimono-sensei wanted me to have this as one more memory of Matsue. 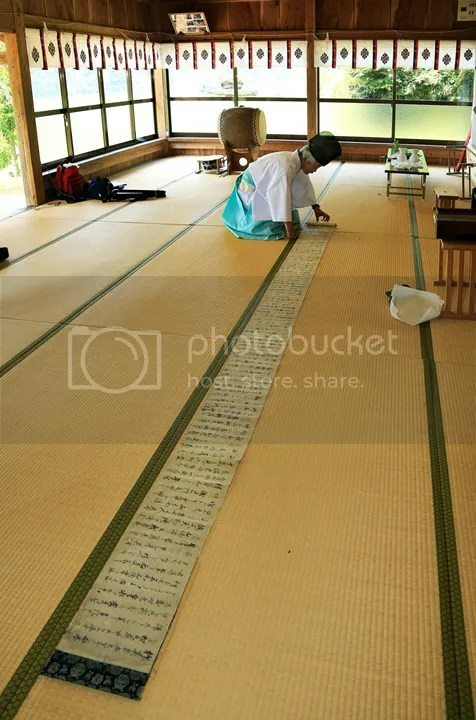 Fast forward to June 26th, when I woke up at 4am to get ready for an Asagayu tea ceremony. Because it’s hot in summer, it’s an early morning tea ceremony served with a light breakfast instead of a full fancy meal. Having, yes, even something as humble as rice porridge can be made very, very fancy when you leave the menu to the discretion of an inn that’s been in operation since the Edo period, where even Lord Fumai himself was known to frequent. After breakfast, we had the very formal okoicha (thickly prepared tea) ceremony in a very small, intimate room, and then the more relaxed o’usu ceremony outside in the garden by the banks of where Lake Shinji meets the Ohashi River. The weather was beautifully sunny to the point of being uncomfortably warm, but the tools all had a cool sense to them—the mizusashi for fresh water was made of very clear glass, the dish for the sweets was silvery and reminiscent of the upcoming Tanabata festival, and there was an enormous green leaf across the table to give everything a refreshing hue. But yes, I mentioned 4am. Because this was a morning tea ceremony, I had to wake up very early to do my hair and make up, and dress in my kimono with room for making mistakes. It was the first time I had used that hydrangea obi since my first tea ceremony in June 2013, when Tea-sensei gave me that obi. I had practiced with Kimono-sensei how to tie a regular taiko obi, but at that time I ended up asking for help after all. Then in June 2016, I had not practiced a taiko obi in forever, and with my busy schedule lately, I barely had tied to do one frustrating practice late the night before. The first shot I took at doing my obi in the morning was a failure, but on the second attempt I tried something else with it which would have made no sense to me before, but somehow trying new things to get the correct form didn’t feel odd. But hey, it worked, and I had about ten minutes of leeway before the taxi came! It was also my first time performing the okoicha ceremony. I did really well–almost flawless, with poise and calmness. I’d like to say it was the fruits of over three years of near-weekly tea ceremony practice, but it was mainly due to being so sleepy that I was seriously nodding off in the mizuya (preparation room). I simply was not alert enough to be nervous, so my hands moved automatically. Everyone said the tea was the perfect, too. I know my knowledge and practice of the tea ceremony is still shallow, but hey, I can say that I can practically perform a tea ceremony in my sleep. This was also my official farewell party from my tea ceremony school. It was very nice to have a formal setting in which many people were gathered so I could express my thanks to them all at once, but I’ll still attend a couple practices before I leave to learn a couple things I should know as an official dues-paid member of the worldwide Omotosenke school of tea. I’ll be able to say a more personal farewell to my regular classmates then. A couple of my other classmates who had taught me a lot arranged for me to go make pottery with a lapsed student of our school who is a professional potter. As of writing this I still have yet to see how they turned out, but it was fun. He helped us make proper tea cups/bowls, and then with the remaining clay he left us to our imaginations. Well……… I’m interested to see how my, erm, very imaginative “flower vases(? )” turn out. As part of that mid-June day, with off and on rain out in the mountainous area around Sada Shrine, the ladies who brought me along prepared a casual tea ceremony in the display room neighboring the workshop. They borrowed some pieces from the potter, and picked from persimmon leaves to place the summer sweets on, and we casually partook of a couple cups of tea while listening to the alternating sounds of bugs and rainfall and talking about the creativity and craftsmanship of his works and works that he admired other places. It was one of those “Ah, this is Japan” moments. 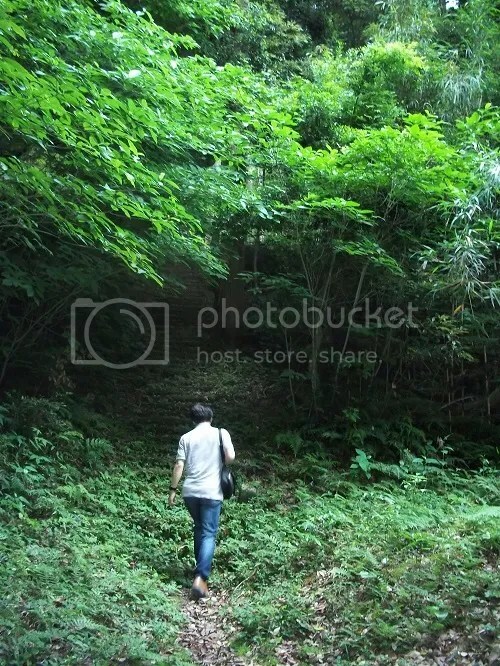 Or at least, “this is my life in Shimane, when I actually slow down and enjoy it” moments. My job as a CIR has of course been very demanding at times, with a very wide variety of exciting and challenging work to do. On the flip side, when I haven’t been as busy, I’ve found many opportunities to use my art as part of my work. I made it a point to do this in my first year. I had always loved drawing and had dreamed for years of writing manga professionally, but for some reason it always felt like I had to keep my passion for anime and manga a secret if I ever wanted to be taken seriously. After some self-published manga I made right before I started the JET Program, I knew I wanted to embrace it and let myself put a little more effort into it, which is part of why I started on the Kojiki manga. Although I saw it as a chance to improve over the course of the years it would take me to write the narrative I had in mind, it turns out I got more and more lazy with it over the course of the project, haha! But I was busy with other projects on the side. Besides the experimental and hastily drawn Tengu manga that won 2nd place in an international contest in 2014, I also fulfilled a long held dream by submitting a short story to a monthly shoujo manga magazine contest last summer. It did not win anything (as expected), but I got professional criticism on it, and was overall very satisfied with the experience. However, I feel it is safe to say that I have worked that dream out of my system—the process of using professional tools and making print-quality manga without assistants and while having a full time job was exhausting. There were many late nights spent on it, and many hours hunched over my work, and the emotional stress of knowing how undeveloped my art skills are due to lack of any practice on the basics. The professional criticism I asked for very aptly suggested I focus on the fundamentals of drawing, and I know myself well enough to know that I’m only interested in doing this as a hobby. However, it is through actually doing it that I’ve figured this out, which is why I feel very satisfied instead of feeling like I’ve given up. Besides, it already felt I had my “debut” in my 1st year when this article came out in the local Sunday paper about my Kojiki project. Furthermore, I’ve branched out a lot, and tried out a lot of different styles and subject matters while I’ve made use of here at the office. I’ve become the go-to person for copyright-free illustrations on fliers and newsletters, so much so that when I walked into work one day and was told, “Buri-chan, we need you to draw Matsue Castle real fast,” it was only mildly startling. I’m really proud of this logo design too. I thought it was only going to be a CIR-made newsletter, but it turns out it’s been used in foreign tourism material as well. I’m sure I’ll always continue drawing as a hobby, and I’ll likely have opportunities to use my kimono and tea ceremony practice in the future. It may not be quite as regularly as I use them now, but I have attained both deep and wide knowledge to take back with me. However, the fact that I am leaving Japan soon really hit home when I was putting away my kimono materials after the tea ceremony the other day. I could pack this all up right now, I thought. That was probably the last time I’ll wear one for a while. That’s a fair distance to walk in one night even if you’re not carrying an enormous bell. Although I had always meant to go see the annual Benkei Festival at Gakuenji, something always kept me from seeing the costumed procession. Although I had always meant to go see the autumn leaf scenery it is famous for, I never did. At last, I had plans to at least visit the temple with Y-chan, but at 3am the night before, I found myself wondering if I shouldn’t bother. With everything going on in daily life getting ready to wrap up my JET contract and set out on a new adventure, I was too busy with all the exciting things going on during the day to be able to settle down and get any sleep at night. The loud thunderstorm certainly wasn’t helping. 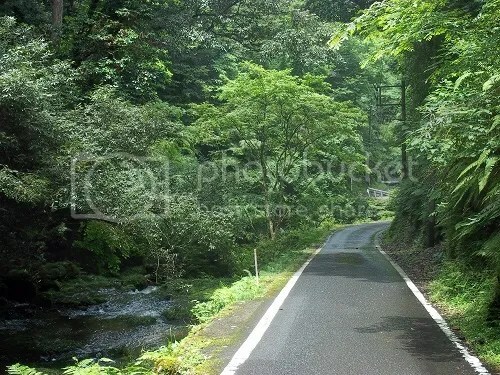 I felt more cheerful in the morning, and Y-chan and I enjoyed the sight of the low-hanging mists as we drove along the bright green rice paddies and into the mountains of the Shimane Peninsula. For whatever reason, there was a massive gathering of white herons on one of the tree-covered hills. Usually you seem them walking alone through the paddies instead. When we reached the parking lot of Mt. Furou we were the only ones there, and we encountered no one as we walked on the road up to the temple and admired the deep green of the forest, the vitality in the flow of the stream, and the curtains of droplets leaking off the cliff sides from yesterday’s thunderstorm. Eventually we found the temple, a strikingly new building among the moss-covered statues of Bodhisattva we had seen along the way. We had to ring a bell to summon someone to the office to pay our entrance fee, as well as ask if there were any places that were off limits due to the damp ground and higher water levels. 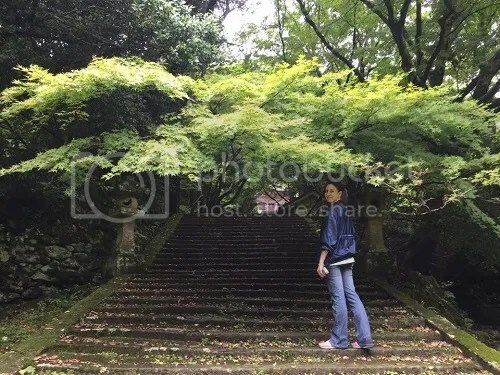 An older man with a gentle temperament welcomed us and gave us the basic description of the temple and where to find the main sights up the stairs and through the forest. 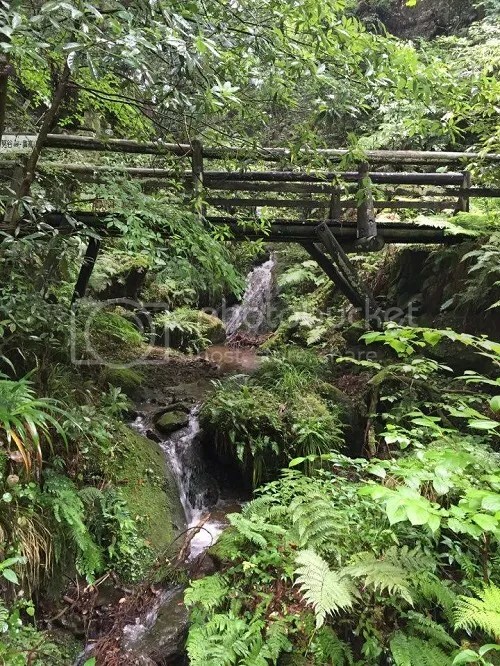 When I asked him about the places associated with Benkei, he first brought up almost the exact thing my guide in Honjo had brought up—many people think Benkei was born in Kii Province, but there is more evidence to suggest he was born in Izumo Province. He suggested I visit the Honjo neighborhood, but I assured him I had already done that the previous Saturday. The man admitted that despite Benkei’s ties with the temple, there is nothing especially obvious for regular visitors to see. 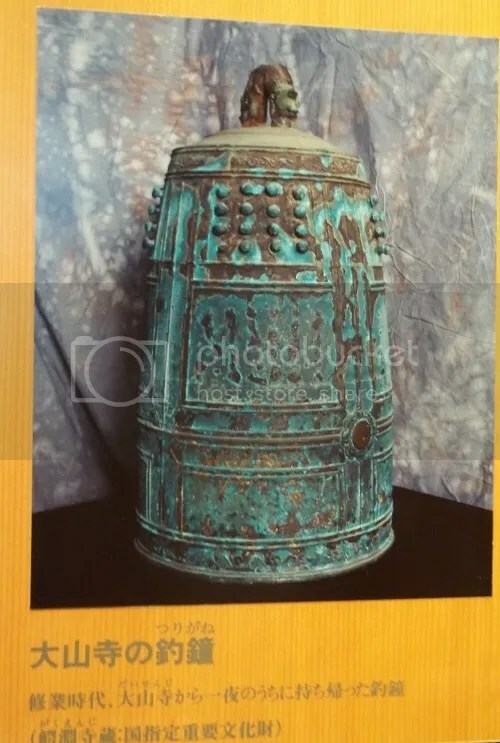 The hanging bell which Benkei carried there from Mt. Daisen was no longer at the temple but instead moved to the Shimane Museum of Ancient Izumo and was recognized as National Important Cultural Property. His self-portrait (he was a painter??) 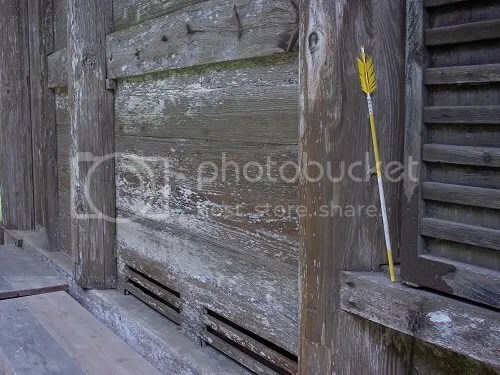 is left at the temple, but in the storehouses. The well his used for wetting his ink stone is still there, but it’s only remnants and hardly recognizable (I never found it), and the hut were he stayed as he underwent his training no longer exists, they only know where it would have been. 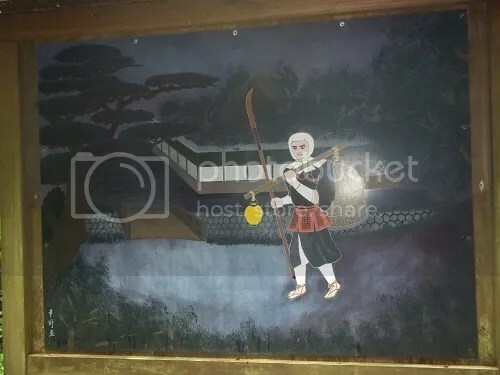 A photo of the wall of Benkei lore at Kanbe-no-Sato, your one-shop-stop for folklore in Matsue. Another photo of the wall at Kanbe-no-Sato. We thanked him for his help and I told just seeing as the temple looks like nowadays would be fine. 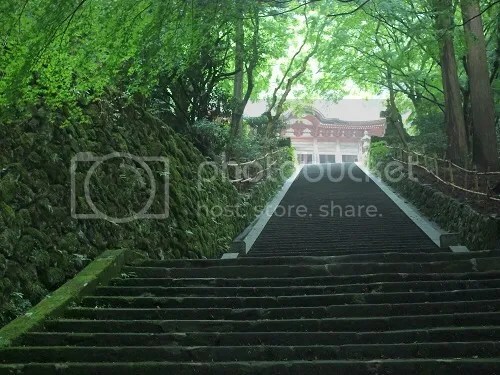 As Y-chan and I headed up the stairs to the main building, we could immediately tell why this was such a famous temple for autumn leaf viewing. The ground was damp, but the animals seemed happy. We found little frogs everywhere–usually taking Y-chan by surprise but jumping right in front of her feet–a hefty raven perched on the roof of the temple, surrounded in mist. Even the snail at the hand-washing font seemed pretty pleased with the weather than June morning. 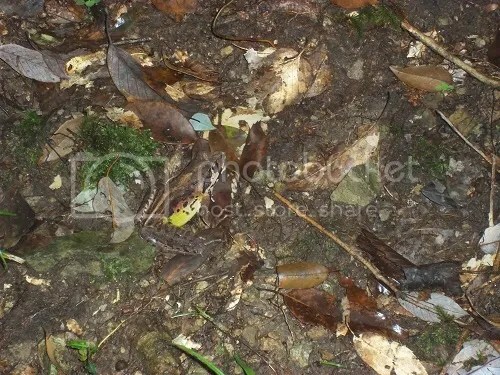 Most of the frogs were very tiny. This guy was not as tiny, but much more still. Y-chan didn’t even see what I was taking a picture of. 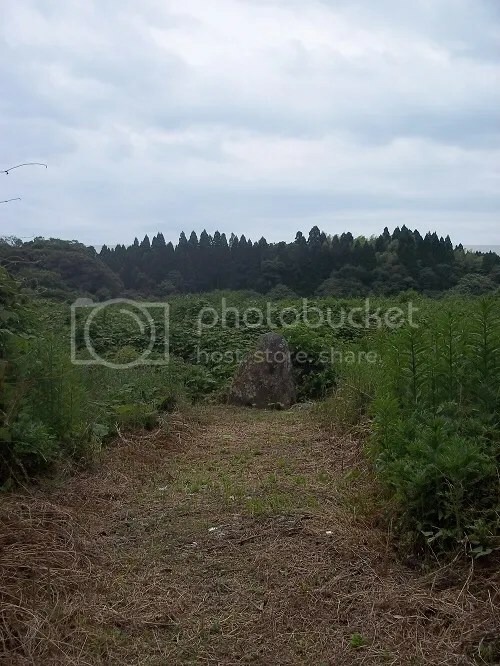 We hunted around for the well up supposed left by Benkei, and although we didn’t find it, we enjoyed many other surprises. Besides the slight discomfort of my sneakers soaking up the moisture left in the ground, and the growing thirst which I had mistakenly thought I could quench by finding a vending machine somewhere along the walk to the temple, the weather and atmosphere was very close to perfect, and exactly the moment in nature I need to calm my thoughts. Despite all the good things that had been going on for me lately, it was feeling like being in a constant state of adrenaline, and stopping and being quiet and enjoying the peace of the temple was exactly what I had been needing. “Oh?” we asked, a little embarrassed to have had our thoughts read. 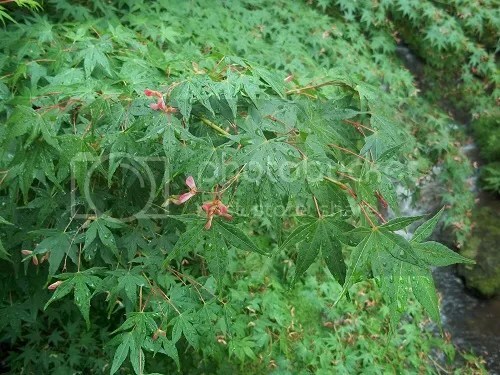 Although I did not check, he was right, I had not noticed any maple trees before we reached the temple grounds. As tempting as it is to picture the actions of people of ages past as something different, something more charming than the modern buildings and getaways we build today, their actions are must closer to current society than to nature. 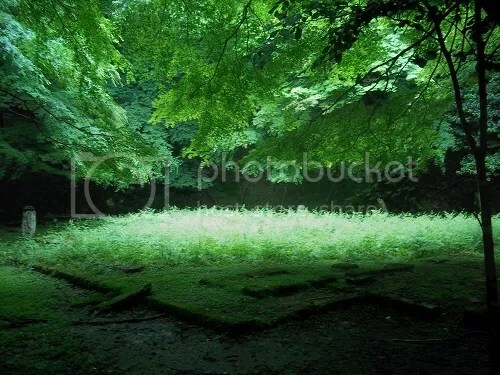 The nature were were enjoying had been custom tailored with societal purpose and a human’s sense of aesthetics, it was merely good fortune that nature played along and made the maple trees so bountiful and the moss so plentiful and the river and waterfalls so atmospheric. 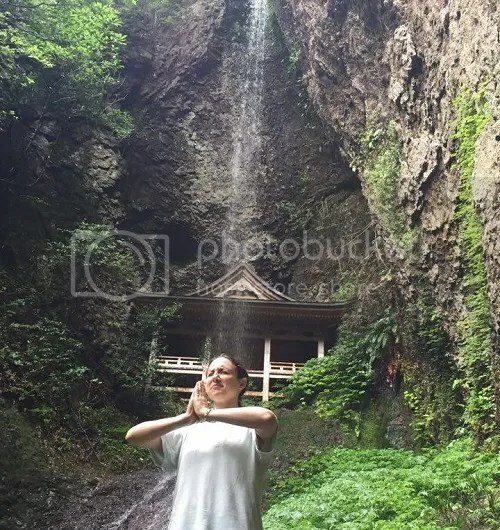 Speaking of waterfalls, that was where we heading next–the main focal point of the temple as it exists in this modern age. 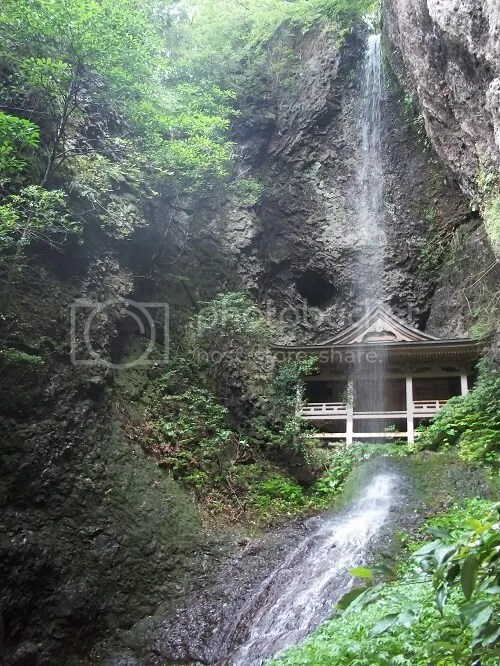 A cave was carved out behind Furou-no-taki (a slight waterfall), and Zaoudou, a little temple to house images of Buddha was built against that cave. The route there was relatively short, but mostly covered in slick moss and even more frogs, and a couple of spots where we’d have to use stepping stones to cross the river. The old man was most enthusiastic about this part of the temple, but reminded us to be careful and watch our steps, and that due to the thunderstorm the night before, the water levels might be too high for us to cross some parts. He sheepishly apologized for that, though he had no control over the weather. The path there, though still man-made, was ever more green than anything else we had already encountered that morning. 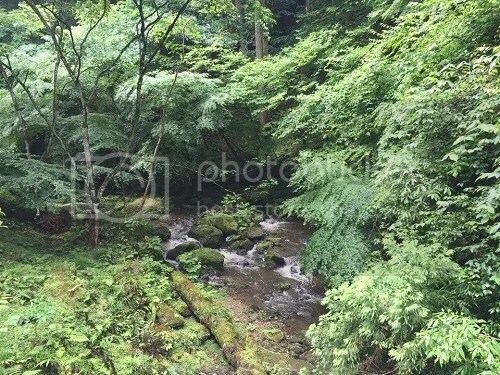 It was somewhere along this 15 minute walk to the waterfall that Benkei had his hut. 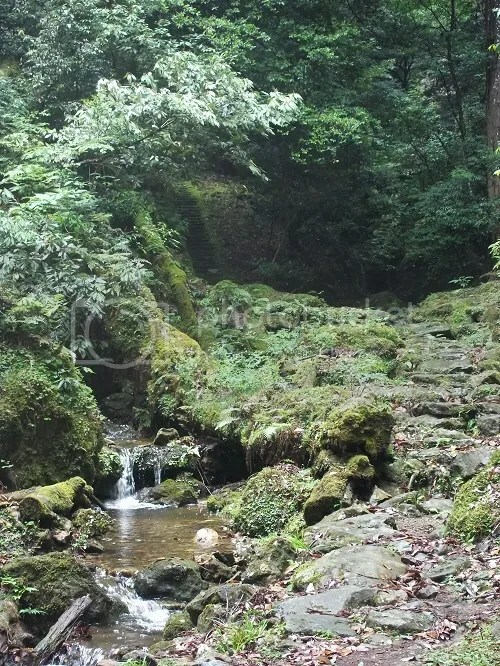 With no Shugendo necessary, we were quite pleased to reach Zaoudou and the tiny waterfall paradise. After having agreed all morning not to push ourselves if things looked too tiring, and to go back if the rain had made things look unsafe, not of that had kept us from reaching this little place, and we smiled and repeated said how good it was that we had came. But maybe a little Shugendo was in order anyway. It was so satisfying to have finally visited Gakuenji–the major Benkei spot I had heard of all this time, and always wanted to go because I was such a fan of Benkei–and found the conversation with the man there and the atmosphere such a dose of calm that I had been needing in my not-very-chill life, that I picked out an omamori to take home with me. Y-chan and I went on to wind through mountain roads and somehow find ourselves driving through Izumo Taisha twice before visiting another shrine that had been on my list to visit for a while, and stopping for coffee before training back to Matsue in the afternoon. I managed to take a short and necessary nap, and was much more ready for naginata practice that day than I had been before. My heel was fine, but in my eagerness to make the most of my sparring time and I injured a toe on my other foot with a hard step, but was so enthused about being there that I didn’t notice the blood until practice was over (oops). At the time I’m writing this, another week has passed. For the last time, I cheered my classmates and teachers on at a naginata competition last Sunday, and said my good-byes to the teachers and students based in Izumo. I have only four more practices here in Matsue, and by the time this is posted, only two. I’m going to make them count, and my feet and I are ready for practice starting in two hours from now. 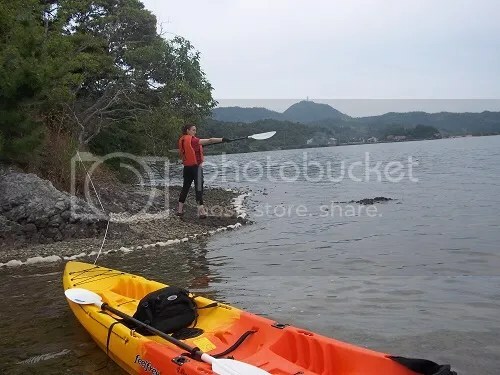 We pick up our own local “Tale of Benkei” at the island on Lake Nakaumi just off shore from Nagami Village. The 12th century villagers were tired of the unusually strong 9-year-old causing them trouble. 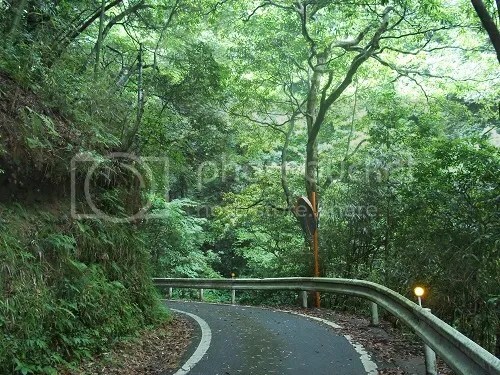 In his letter left behind in Nagami Shrine, he admits it was cold out there, but boasts that he was fine. 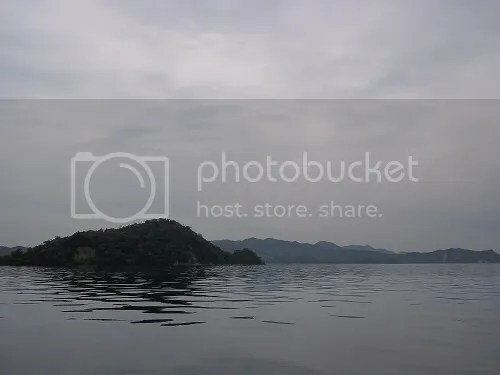 On the island, however, young Benta–or perhaps he was Oniwaka by now, but either way, eventually Benkei–met his father. His warrior monk father had wandered back into the area, and trained with young Benkei there. Today, this island is known as Benkei Island. 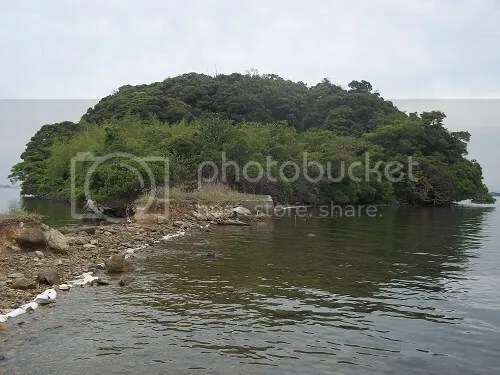 Although there used to be a road attaching it to shore, that has long since crumbled away, and now it is only accessible by boat. In recent-ish history, a family used to live there for a long time. Lucky for me I am friends with a boat safety instructor in the area who served as my guide to all the Benkei related spots in Honjo that day. Lucky for us, this day finally worked out. We had been trying for two years to find a time to go do this, but every time we tried to choose a date, it was would too late in the season, or the weather would turn on us and be too windy. Much like all the effort I put into visiting Kaka-no-Kukedo! Prior to the day we went, we weren’t sure if we’d actually go. The weather forecast said there would be rain, and we wouldn’t know the condition of the waves until the day itself. Seeing as this would be my last good chance to go, we agreed to scope things out as early as we could that morning. It turns out it was a beautiful morning for sea kayaking out on a brackish lake. It was overcast, so we only had the distance outlines of the “scary” Eshima Bridge and of Mt. 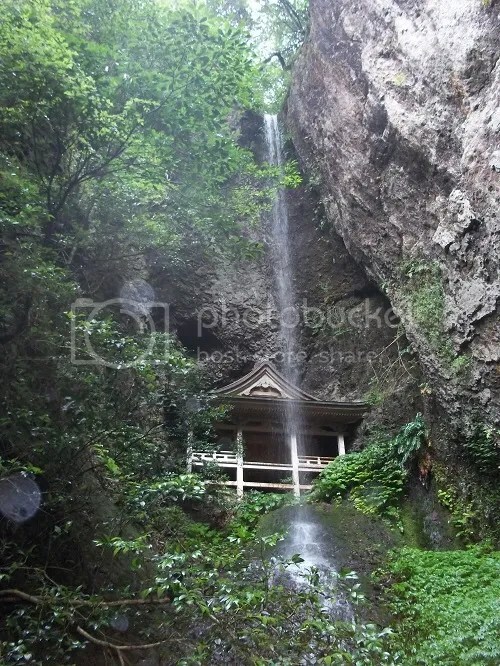 Daisen, which is also an important spot in Benkei lore which I will touch in the following entry. Although there was rain later than afternoon, in the morning, there were no waves on the lake. It was very peaceful out there. That said, it’s a little startling to be enjoying the ride and then all of a sudden you realize you are surrounded by hundreds of jellyfish. 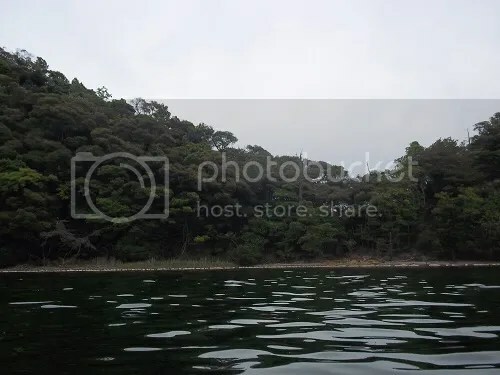 I’ve seen moon jellies as far as the Ohashi River in Matsue’s city center, which connects Lake Shinji with Lake Nakaumi, but it seems they are common enough in Nakaumi that the people there know not to swim without body suits. They were so close to the surface that I was worried I would scoop one out of the water on my oar and have it land on my head. 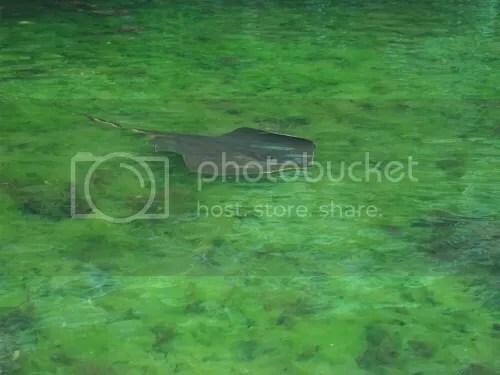 Around the island I loved seeing how undisturbed the natural life was, such as the crabs, and the bright seaweed, and then sting ray—-wait, the sting ray!? Okay, maybe not as exciting as the ocean life I saw while sea kayaking around the Oki Islands, but still cool. We could not freely explore the island, but it seemed like the perfect little getaway to focus on martial arts training. 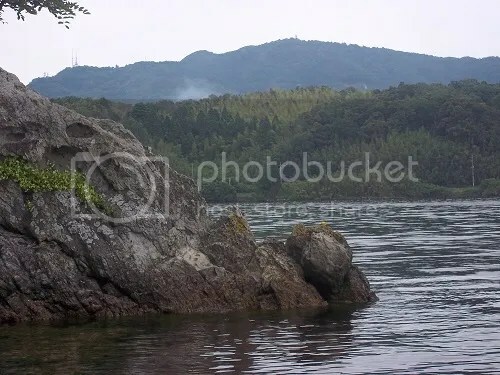 A few months after he had been brought to the island, and after Benkei’s father disappeared from his life again, the now 10-year-old child threw rocks in the water to make himself a path back to shore. Being the dork I am, I had to celebrate visiting the training grounds of a famous naginata-ka by wielding my oar like a very poorly constructed naginata. Speaking of naginata construction, one of the people who came with young lady Benkichi from her hometown in Kii Province was a swordsmith. As strong as Benkichi was, you couldn’t expect a young lady to move to an unfamiliar place all alone! You could think of this man as an uncle of Benkei. He made an exquisite naginata for the 15-year-old warrior, and it was an amazing weapon that took a thousand days to make. It was so amazing that Benkei already became jealous of there being any other weapons just as good as it, so he asked, “Are you planning on making any more of these for anyone else?” And the swordsmith answered, “If they pay me enough, yes.” To prevent this, Benkei made a hasty decision and sliced the swordsmith down with the naginata of his own making. Over the course of the following couple years, Benkei regretted killing him, and prayed for him at his grave. The original location used to be at the top of the hill, but it was rediscovered when construction on a road required cutting into the hill. 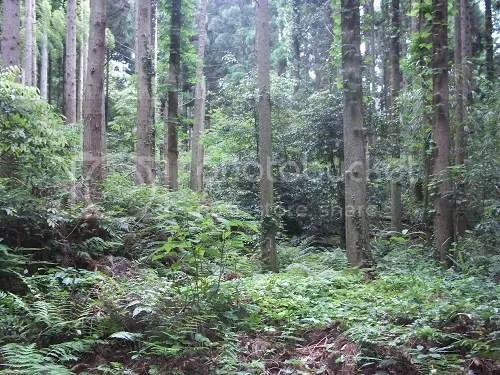 It is now located at the side of the road leading to the Honjo district, directly beneath the spot it had occupied before. Young Benkei still had quite a bit of training ahead of him in the surrounding area: at Mt. 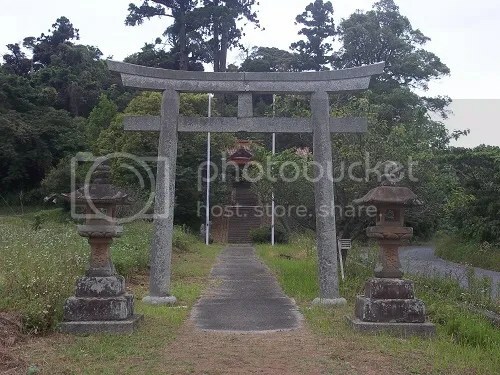 Makuragi, at Nagamizu Temple, and most famously, at Gakuenji Temple. 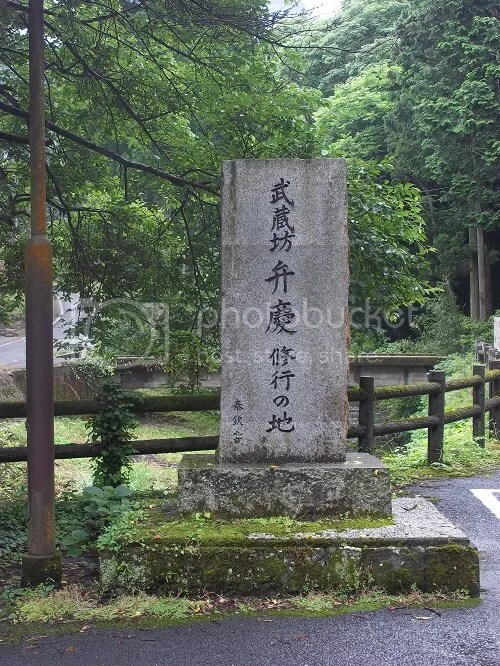 We’ll touch on Gakuenji in the following entry, but to continue to the story of the letter he supposedly recorded and left there, Benkichi fell ill right around the time teenage Benkei regretted killing his swordsmith uncle and was about to leave to undergo training as a monk. She called him close to her sick bed and told him about her past, and told him how proud she was of what a strong young man he had grown into. 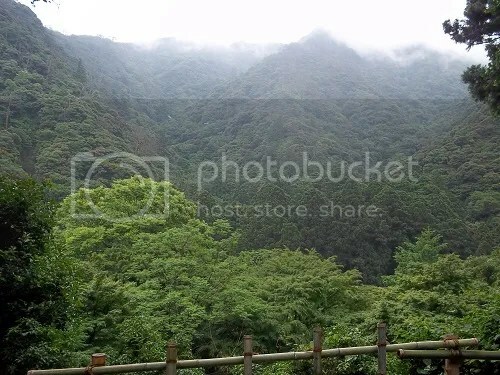 Since his father’s origins were a mystery, she told him to visit his relatives in Kii Province, and call himself a member of the Tanabe clan when he set off into the world as a monk. After she passed away he recorded all of her wishes in the letter he wrote there in the shrine, and he touched on his own experience training with his Tengu-like father and how he regretted slaying the man who put so much effort into making such a fine naginata for him. 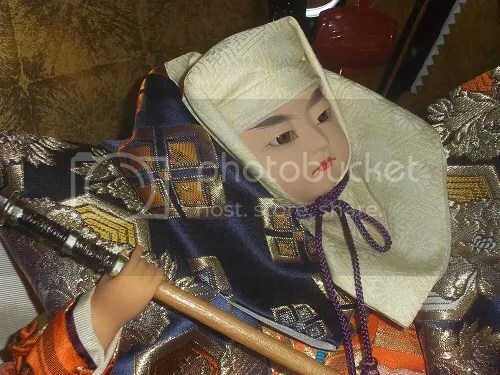 He left the letter there in her memory, but because he followed her wishes to visit his relatives and call himself a member of the Tanabe clan in Kii, that is likely why there is confusion as where Benkei was actually born, much less raised. 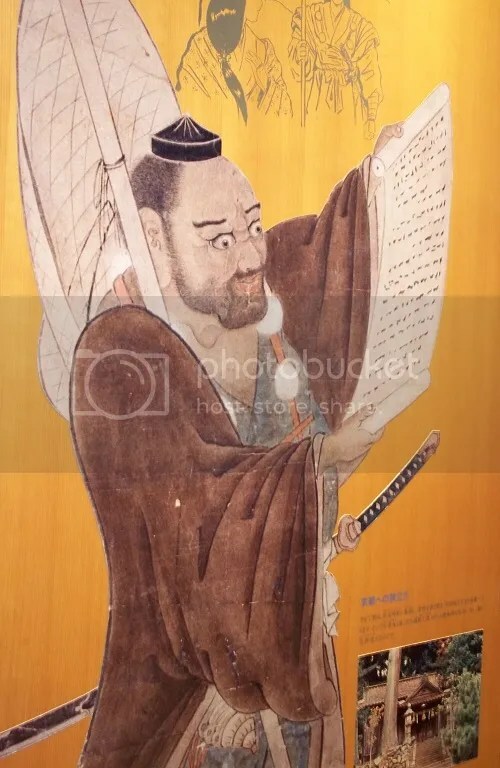 Regardless, he would be famous for his exploits in Minamoto no Yoshitsune’s service all over the Warring States of 12th century Japan. WHACK! !—a fierce 10-year-old made a strike at my inner shin, but as I was moving my leg out of the way, her bamboo blade struck my heel, and my first sparring practice in months was cut short by the big bump that immediately formed. 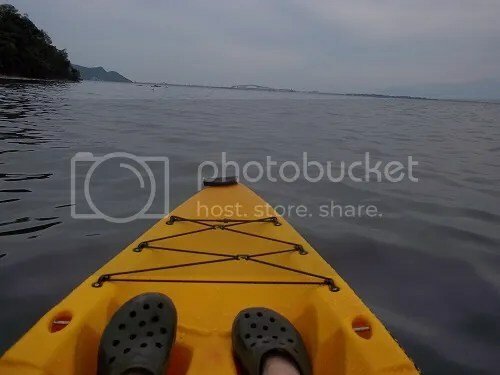 Less than two days later, I found myself hiking and kayaking around the Honjo district of Matsue, along the north banks of Lake Nakaumi. I had long since heard that Benkei was born there, and I had even longer since heard of Benkei. Benkei, as in Yoshitsune and Benkei, one of Japan’s ultimate dynamic duos of (semi-fictional?) history. This pair is immortalized in the tragic Tale of Heike, known for their battle exploits throughout Japan, and ultimate demise due to Yoshitsune being betrayed by his own brother. I had already heard of the “Standing death of Benkei,” as he died pelted with arrows while single-handedly defending the house of his master at the Battle of Koromo River. It just so happened this week fell around when Boy’s Day is celebrated in the San’in region, given the 1-month delay. 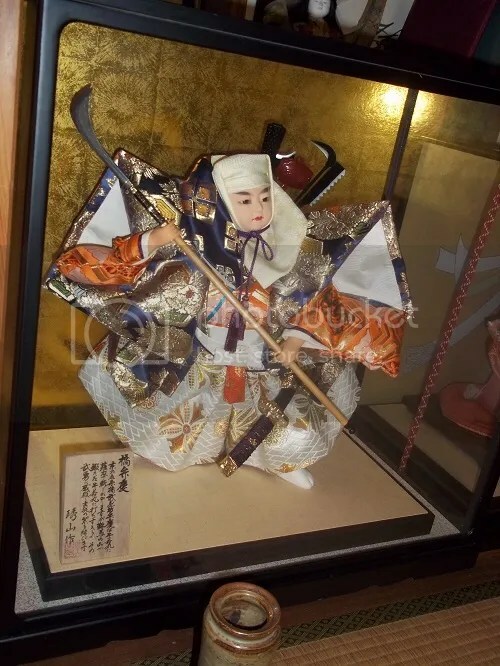 My guide’s family had a display taking up half their tatami room, including this Benkei doll. 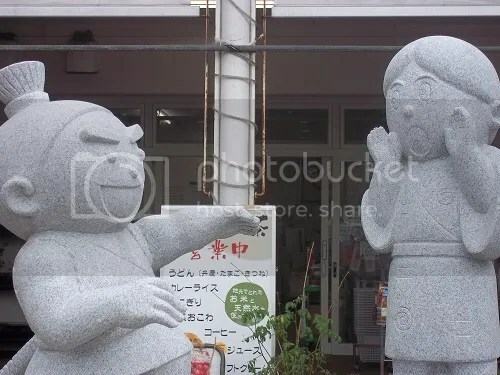 Reminds me of the cute and chubby statue of Benkei and Ushiwaka at Gojo Bridge in Kyoto. 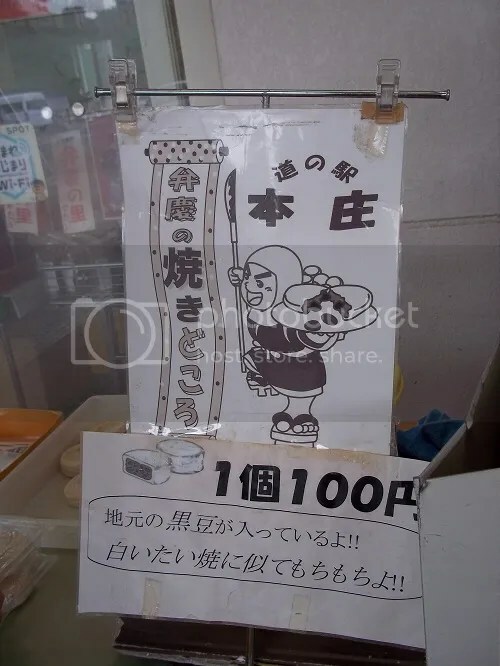 This strongman of Japanese culture is also the star of the phrase “Benkei no naki-tokoro” (the spot that makes Benkei cry), which is to say that because he doesn’t have muscle on the front of his shin, that’s his only weak spot, and it’s really, really weak. It’s essentially the same as the phrase “Achilles heel.” Speaking of heels, mine was a couple shades of purple. What a regrettable naginata sparring practice that had been; I wasn’t focused on the moment, one of my last moments to be practicing naginata here in Matsue! And here I was, looking for material on the most famous warrior monk naginata wielder in history. 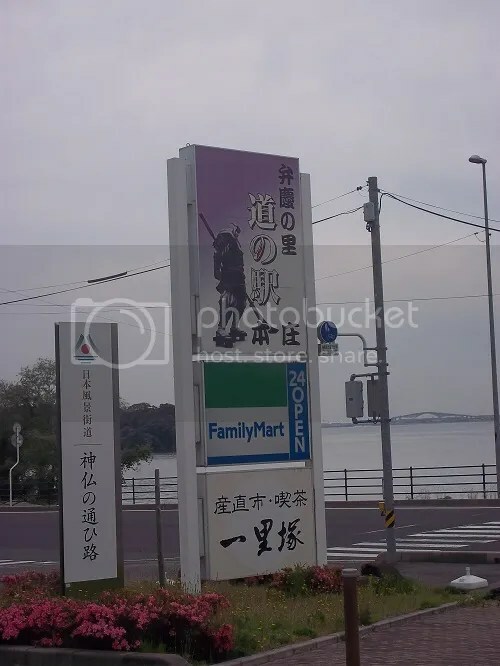 The Benkei lore takes a back seat to Kojiki mythology here in Matsue and the wider Izumo region, and unlike the city of Tanabe in southern Wakayama Prefecture, not a lot of tourism emphasis is placed on it. People in the Honjo neighborhood, however, are very enthusiastic and proud of all the historical traces he supposedly left behind. 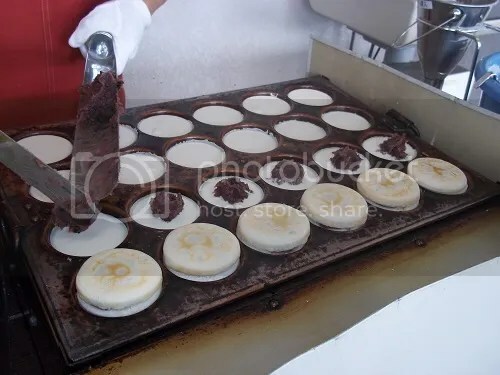 These “Benkei no yaki-tokoro” (the spot that made Benkei fry) were sold by a statue of baby Benkei and his mother. I’ll explain the context of that statue later. 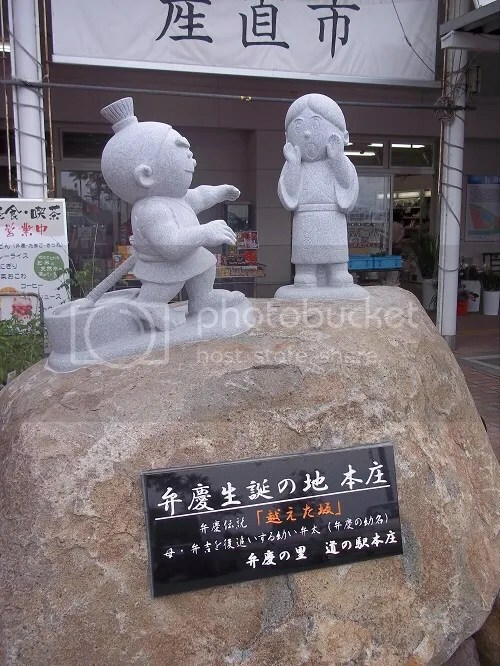 You might have heard claims that Wakayama is Benkei’s birth place, so we need a little background information to Shimane’s claim to it. Let’s start with the letter in Nagami Shrine’s storehouse, which supposedly was written by Benkei himself about his own past (and supposedly copied and rewritten later, but that’s historical territory I’m not prepared to jump into). He wrote the letter upon his mother’s death and left it in the shrine in her memory. After taking care of that, he went off to Kyoto to challenge people and take their swords and then have his fateful encounter with young Ushiwakamaru (his future master Minamoto no Yoshitsune) at Gojo Bridge in Kyoto. 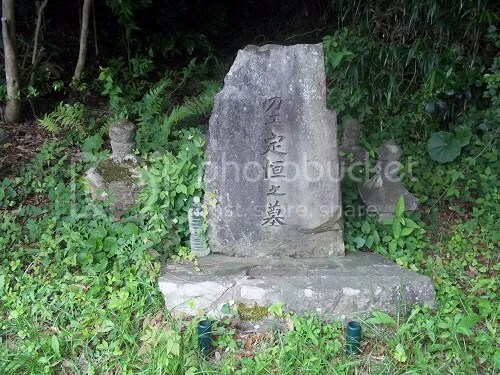 Photo of the letter at Nagami Shrine used with permission. According to that letter, Benkichi was a woman born in 1128 to the Tanabe clan in Kii Province (modern day Wakayama and Mie Prefectures). Although she came from a good family, by the age of 20, she still had not gotten married. Perhaps this was because she wasn’t pretty and because she was very tall and buff (I heard she was about 180cm/70in), or perhaps it was because of the sins of her parents that she needed to cleanse herself of (as she was told in a dream). 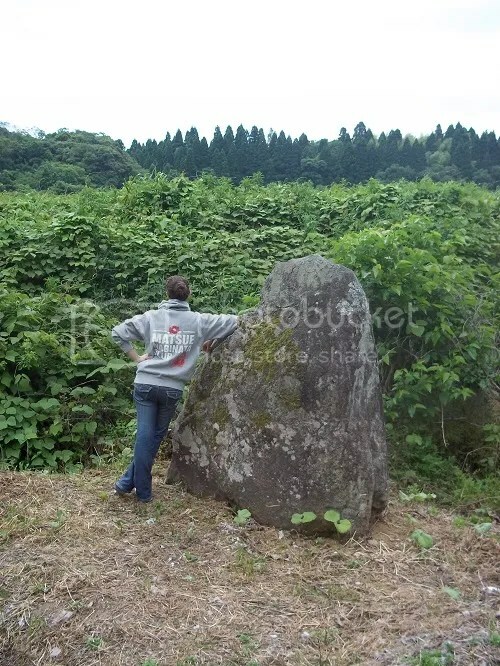 Whatever the case, her family sent her to the Izumo region to pray for some good En-musubi. Yes, Izumo was already a matchmaking destination for young single women back in the day. Izumo Taisha has a very, very long and influential history. 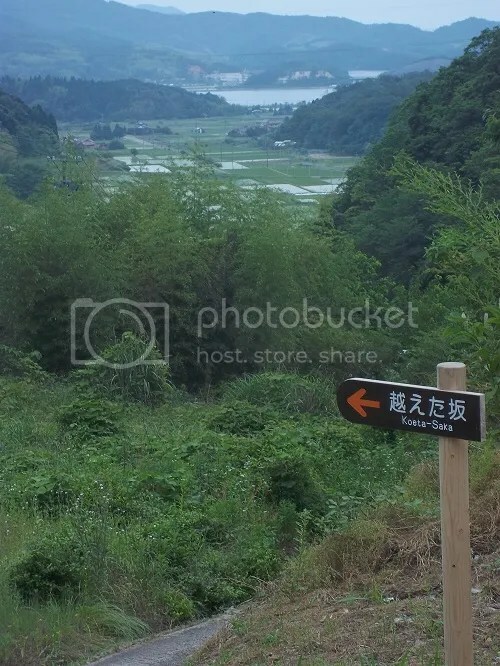 After not having much luck on the southern banks of Lake Nakaumi, she was told in the aforementioned dream to move to Nagami Village at the foot of Mt. Makuragi for seven years. While she was working the fields there to make her living, and before anything close to seven years had passed, she encountered a striking young warrior monk dressed like a Tengu (because that was a stylish thing for wandering warrior monks to do back then). As was the custom, they flirted with each other through witty poetry, and when he gave her a branch of peach blossoms, they agreed to become husband and wife. Some husband he turned out to be. Though they remained married (and supposedly happy together), he went off to do his wandering warrior monk stuff and Benkichi remained in Nagami Village with a tough pregnancy ahead of her. It was said to have took a whole thirteen months, and she had such a strong craving for iron that she absentmindedly started eating gardens hoes. She was halfway through eating the tenth one when the other villagers finally noticed and stopped her. In the morning on the third day of the third month of the first year of the Ninpyou period (that would be March 29, 1151, but again, this is merely the contents of this letter and not the only story out there), baby Benta was finally born. He would later be called “Oniwaka” (something akin to Young Ogre), and later still he would change his name to Benkei. Baby Benta was born with long hair, teeth, the name of a Buddhist god of war written on his left shoulder and the name of a Great Tengu written on his right shoulder. Most of his skin was iron and black, except for a little bit around his throat because his mother did not finish eating that tenth garden hoe. He was a frightening looking child, but Benkichi was thrilled to have him. While telling her adult son this story later, she admitted he was born looking like this because she had eaten so much iron during the pregnancy. 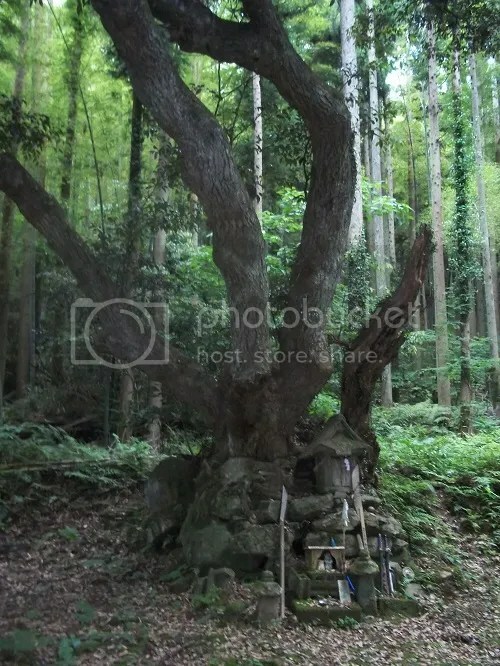 The spot where Benkei was born is now called “Benkei no Mori” (the Forest of Benkei) and pregnant women pray there so that they might have a safe labor. In the past, women preparing for childbirth would stay in a hut in the forest. 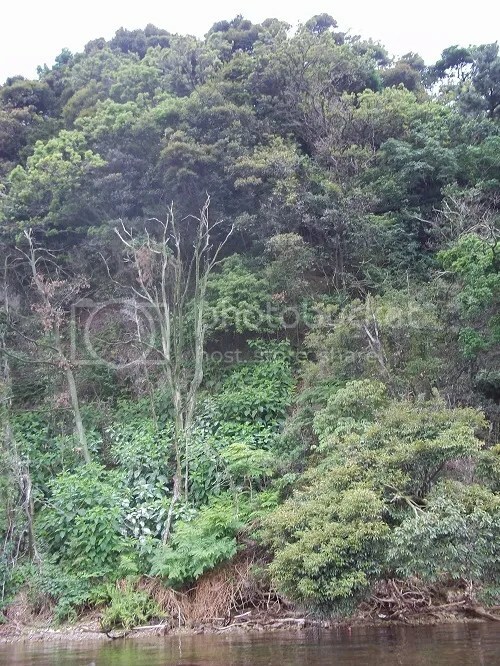 Today, I have to wonder how safe it would be for a very pregnant woman to climb the steep and slick steps to that clearing in the forest. However, the toy swords and naginata left there are proof of the gratitude of those who safely gave birth and came back later to leave their thanks. This is where the hut for the pregnant ladies used to be located. Baby Benta was too strong for his own good and a difficult child to raise. 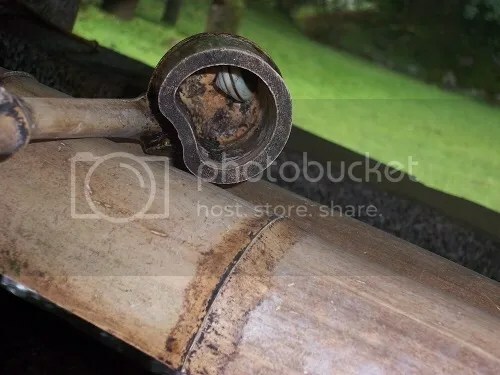 There was a time when poor Benkichi could not get any work done because he wanted to follow her everywhere, so in a desperate effort to get him to stay put, she tied him by the waist to a heavy mortar. Her efforts were in vain, and the baby boy surprised his mother by dragging the mortar all the way up a high hill to follow her. 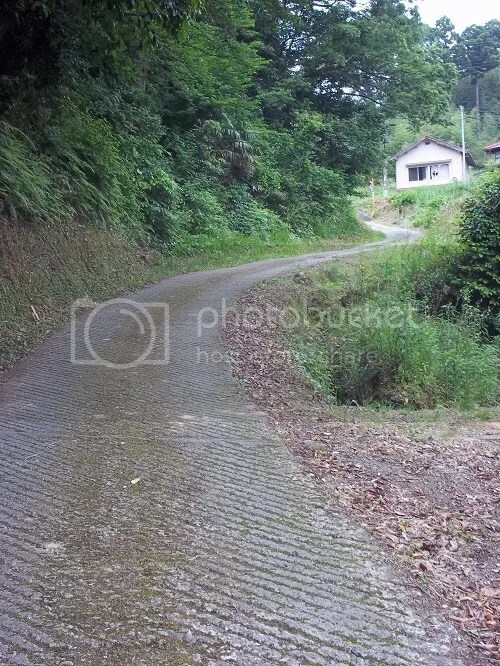 Today, that hill is called “Koeta-saka,” (the hill that was overcome). 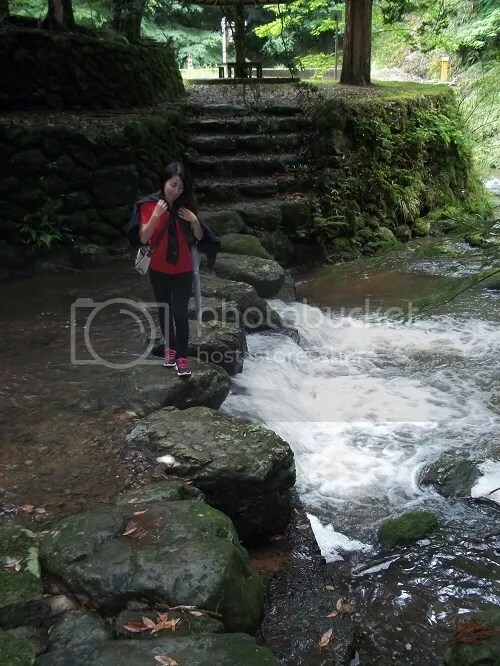 It was steep enough that my injured heel felt tender with each step, and I would have been surprised if any baby would go all the way up, weighed down or not. It twists and turns a lot, you can’t see the scale of it in any single photo. Yes, that’s Lake Nakaumi out there. Yes, that is me in my naginata sweatshirt. 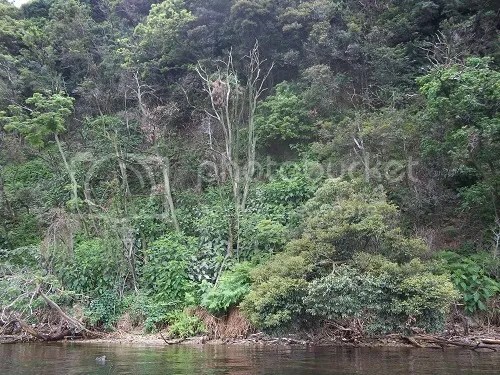 When telling her young adult son about their past, Benkichi told him that it was because of all the trouble he caused that the villagers cruelly forced them to move to an island on Lake Nakaumi, just off shore. 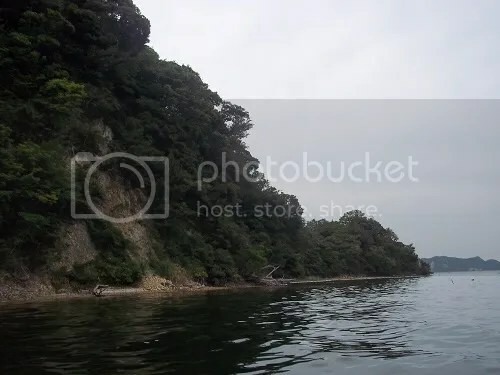 Far enough, I am told, seeing as Benkei could not swim due to his muscles being so heavy. This island was a fateful place for the 9-year-old boy, which I will explain in the following entry. That said, keigo is a very standard part of actively used Japanese, not a separate language. I suppose after nearly four years in a Japanese office this improvement shouldn’t be surprising, but there is a big difference in satisfaction between answering keigo questions correctly on N1 of the JLPT and actually using it in a way that sounds natural in daily life.